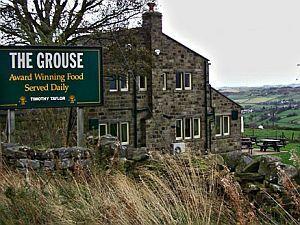 The Grouse Inn01535 643073work Restaurant - PubNestled high above the Worth Valley, with breath-taking views over the Brontë Sisters' famous moors, the Grouse Inn offers a true Yorkshire welcome. You can be assured of the very best in home-cooked food, real Yorkshire Ales, a well-stocked wine cellar and a view to match any in the country. There is a patio / beer garden & grassed area to enjoy in the summer, and real open fires in winter add to the warmth of welcome you are sure to receive. Timothy Taylor Golden Best - Best Bitter - Landlord. Nestled high above the Worth Valley, with breath-taking views over the Brontë Sisters' famous moors, the Grouse Inn offers a true Yorkshire welcome. You can be assured of the very best in home-cooked food, real Yorkshire Ales, a well-stocked wine cellar and a view to match any in the country. Real fire - outdoor drinking area - lunchtime + evening meals - wheelchair access - traditional pub games - pub parking - smoking area - dogs permitted - children welcome.